(Boston, MA, January 15, 2015) American Experience announced today that its productionLast Days in Vietnam, directed and produced by Rory Kennedy, has been nominated for the Academy Award® for Documentary Feature. This is Ms. Kennedy’s first Academy Award® nomination, and the ninth for the series. Last Days in Vietnam chronicles the chaotic final days of the Vietnam War as the North Vietnamese Army closed in on Saigon. With the clock ticking and the city under fire, American officers on the ground faced a moral dilemma: follow official policy and evacuate U.S. citizens and their dependents only, or ignore orders and save the men, women, and children they had come to value and love in their years in Vietnam. At the risk of their careers and possible court-martial, a handful of individuals took matters into their own hands. Engaging in unsanctioned and often makeshift operations, they waged a desperate effort to evacuate as many South Vietnamese as possible. 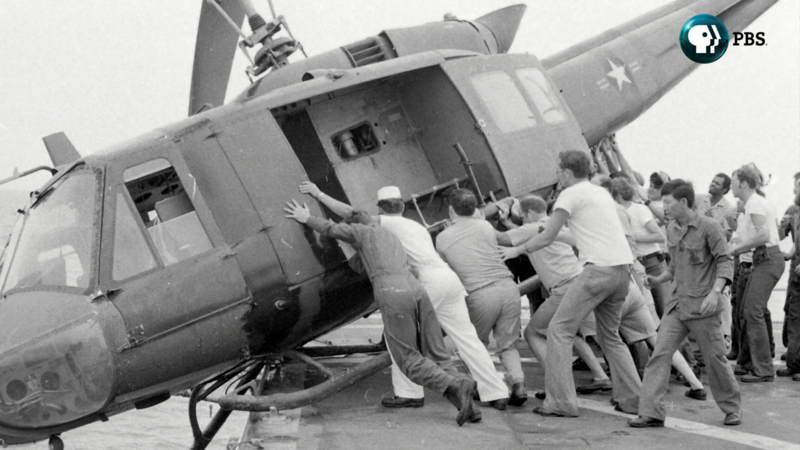 Following its world premiere at the 2014 Sundance Film Festival, an eight-month festival run, and 120 engagement theatrical run, Last Days in Vietnamwillpremiere on American Experience on Tuesday, April 28, 2015, 9:00-11:00 p.m. ET (check local listings) on PBS, in conjunction with the fortieth anniversary of the fall of Saigon. Rory Kennedy, American Experience Executive Producer Mark Samels, and participants from Last Days in Vietnamwill be featured at the Television Critics Association Press Tour in Pasadena on Monday, January 19, 2015. In addition to the upcoming broadcast on PBS, Last Days in Vietnamis available for rent or purchase on iTunes and Amazon Instant Video, as well as through many cable video-on-demand services. Following the PBS broadcast, the film will be able for streaming free on PBS.org/americanexperience. The DVD will also be available for purchase on ShopPBS.org and other retail outlets on April 28, 2015. Rory Kennedy (Director/Producer) is an Emmy Award-winning independent documentary filmmaker as well as co-founder and president of Moxie Firecracker Films. Her films cover an array of issues ranging from poverty to politics to human rights. Her work has been shown on PBS, HBO, A&E, MTV, and Lifetime. Her most recent project, Ethel, premiered at the 2012 Sundance Film Festival, was broadcast on HBO, and nominated for five Primetime Emmys. Kennedy has directed and produced more than twenty-five documentaries including Ghosts of Abu Ghraib (Primetime Emmy Award for Best Non-Fiction Film, 2007); Thank You, Mr. President: Helen Thomas at the White House; American Hollow; A Boy’s Life; and Pandemic: Facing AIDS. Mark Samels (Executive Producer) was named executive producer of American Experience, PBS’ flagship history series, in 2003. Under Samels’ leadership, the series has been honored with nearly every industry award, including the Peabody, Primetime Emmys, the duPont-Columbia Journalism Award, Writers Guild Awards, Oscar nominations, and Sundance Film Festival Audience and Grand Jury Awards. Prior to joining WGBH, Samels worked as an independent documentary filmmaker, an executive producer for several U.S. public television stations, and as a producer for the first co-production between Japanese and American television. A native of Wisconsin, he is a graduate of the University of Wisconsin-Madison. Television’s most-watched history series, American Experience celebrated its twenty-fifth anniversary in 2013. The series has been hailed as “peerless” (The Wall Street Journal), “the most consistently enriching program on television” (Chicago Tribune), and “a beacon of intelligence and purpose” (Houston Chronicle). On air and online, the series brings to life the incredible characters and epic stories that have shaped America’s past and present. Acclaimed by viewers and critics alike, American Experience documentaries have been honored with every major broadcast award, including thirty Emmy Awards, four duPont-Columbia Awards, and sixteen George Foster Peabody Awards, one most recently for the series represented by Freedom Riders, Triangle Fire, and Stonewall Uprising.